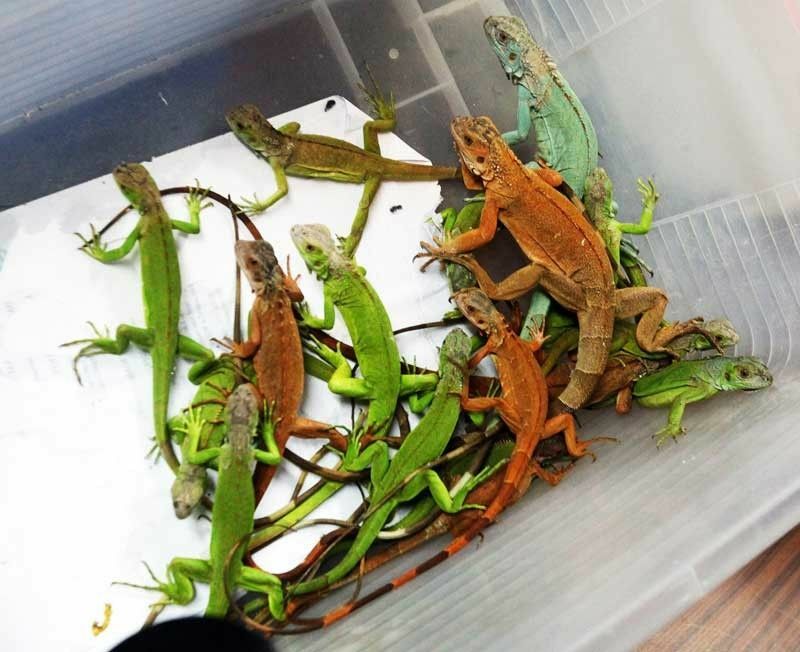 Iguanas, smuggled in black socks and a water bottle by a traveler from Thailand, are prepared for turnover to the Department of Environment and Natural Resources at the Ninoy Aquino International Airport yesterday. MANILA, Philippines — Bureau of Customs (BOC) officers at the Ninoy Aquino International Airport confiscated 56 iguanas brought by a Filipino traveler from Bangkok, Thailand at past midnight yesterday. In front of Neil Ryan Dysoco, BOC officers examined two pieces of his luggage and and found the iguanas, five of which were dead. Some of the iguanas were placed in black socks while others were placed in a water bottle. The lizards were turned over to Department of Environment and Natural Resources (DENR) officials at the airport. Republic Act 9147 or the Wildlife Resources Conservation and Protection Act said any individual must secure a permit to bring out or import wildlife. Arnel Mataro of the DENR said the iguanas will be brought to the Ninoy Aquino Parks and Wildlife Center in Quezon City.